Logic Pro uses a validation tool to ensure that only plug-ins that fully comply with the Audio Unit plug-in specification are used in Logic Pro. This minimizes problems that may be caused by third-party plug-ins. The validation process takes place automatically when Logic Pro is first opened, when an updated version of Logic Pro is installed, and when you install new plug-ins or update existing ones. In the left column of the Plug-in Manager window, all internal Logic Pro plug-ins are sorted by Category, and all installed Audio Unit plug-ins are sorted by Manufacturer. The results of the validation scan are shown in the Compatibility column at the right of the window. You can organize and manage plug-ins by simply dragging within the Plug-in Manager window. You can also create new plug-in categories and rename or remove existing ones as well as search for individual plug-ins by name. The Plug-in Manager is only available when Show Advanced Tools is selected in the Advanced preferences pane. 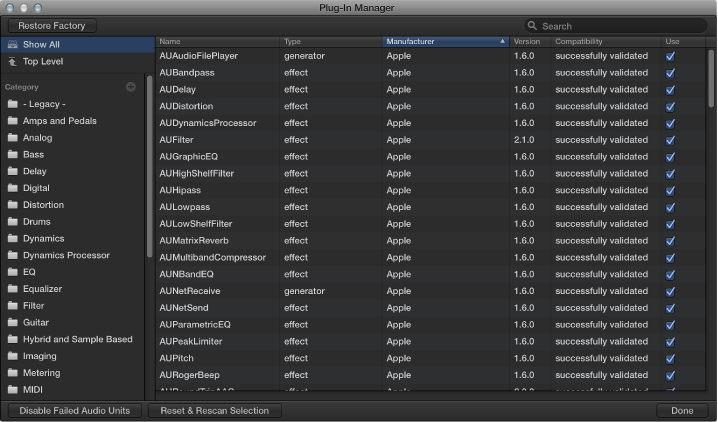 Choose Logic Pro > Preferences > Plug-in Manager. Click the Plus button (+) to the right of the Category column header. Enter a new name for the Untitled folder that appears, then press Return. Double-click the folder, enter a new name, then press Return. Select the category or plug-in, then press the Delete key. Control-click the category or plug-in, then click Remove. Enter a search term in the search field, then press Return. Any plug-ins that match your search term are displayed in the results list. Select Show All in the upper-left part of the Plug-in Manager window. Select the plug-in’s checkbox in the Use column to enable it. You should be aware that these plug-ins can cause problems. If you encounter problems with manually-enabled failed plug-ins, click the Disable Failed Audio Units button. Deselect the plug-in’s checkbox in the Use column. You can rescan a selection of plug-ins after installing plug-ins/updaters or moving components in the Finder, while the Plug-in Manager is open. Click the Reset & Rescan Selection button. The plug-ins will be activated automatically, if they pass the validation scan.